Abuja — Some 24 Nigerians remain trapped in deadly conditions at Libyan prisons after turning down an offer for repatriation by their government. They have retained hopes of reaching Europe. Abike Dabiri-Erewa, Foreign Affairs and Diaspora Special Assistant to Nigerian President, Muhammadu Buhari, confirmed the refusal of the 24 migrants to return home. "They have refused to come back insisting they must get to Europe," Dabiri-Erewa said. She however reiterated the Nigerian government would continue ensuring all migrants stranded in Libya and willing to return to their country would be repatriated. So far, more than 9 400 Nigerians have been repatriated from Libya in collaboration and support of the International Organisation for Migration (IOM). Buhari early this year directed the immediate evacuation an repatriation of Nigerians from Libya. The latest batch of returnees includes 116 Nigerians traced to the Osama detention centre in the northwestern Libyan city of Zawiya. Their repatriation follows pleas recently captured in a video that went viral, of some trapped Nigerians in Libya appealing for their government to rescue them. In the video, the Nigerians claimed some colleagues had been tortured to death in detention in the North African country. They disclosed security agencies in Libya intercepted and locked them up in dehumanising conditions. Libya, the civil war-torn country, remains a gateway to Europe for African migrants seeking better economic opportunities overseas. 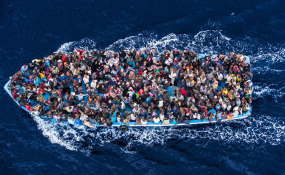 Deceitful smugglers facilitate the journeys via the Mediterranean Sea through rickety ships.